Adding ‘acid’ to every meal brings balance to your meal. This is easily achieved by using your ‘pickles’ and ‘chutneys’ to add this acid with the dual benefit of adding your daily dose of probiotic power. Use fermented tomato sauce instead of shop tomato sauce.. Substitution is the quick and easy way of getting all your fermented foods/beneficial bacteria into your diet. Avoid cooking your fermented food when possible. Adding it last on the side of your meal is an easy way of doing this. List 3 foods (jars/sauces/mayo/flavour packets) you use everyday to cook with/eat. Find an easy recipe for each one to make your own fermented version. If you are unsure.. drop me a line below and I will do my best to help you. We use Mayo a lot in our house so I found an easy Mayo recipe (you can find it here)… and make many variation of it… this increases my health and the health of my family exponentially! For those of you sceptical that the flavour will be different, let me put your mind at rest.. 99% of the time you will notice no difference. 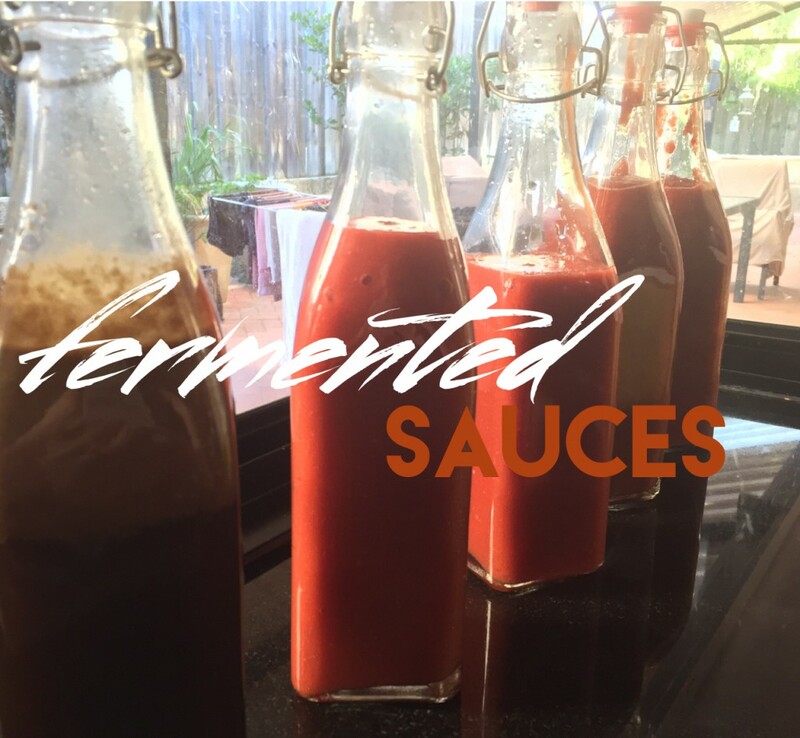 I haven’t noticed a flavour change in any of the Sauces and Condiments I have fermented.. the flavour profile that does come with fermented foods is ‘sourness’. I factor this into all of my recipes so that I can “have my cake and eat it too” (hehe). I have struggled with food addiction my whole life and I still struggle with it… but I refuse to give in to it… I continue to research and look for answers because I know I’m not a bad person.. I just need answers.. When I discovered Probiotic Capsules and started taking them everyday (for the last few years) I noticed differences with food cravings, toilet habits, energy levels and feelings of wellness… and so I have continued to take them. I have recently been learning from Dr Natasha McBride and her research with the GAPS Program and as I am practising key principles of this eating program I am feeling further benefits from having Fermented Foods in my regular food program. Dr McBride is a neurologist and medical doctor who helped her son heal Autism with diet! Amazing stuff.